Since civilization farmers, healers and craftsmen have meticulously observed the influence of sun, moon and planets on plants, animals and humans. Agriculture was greatly influenced by the lunar rhythms. Farming operations like tilling land, planting, harvesting and wild collection were based on the lunar influences. The science of Astrology and Astronomy was well known in the Indian subcontinent few thousand years ago much before the subject was understood in the Western world. In addition to the influence of planets and zodiac, Indian Astrology used star and star galaxies to understand the moon phases with intricate details. Like Indians, Romans were also intrigued by the cosmic rhythms. Pliny (23-79 AD), a renowned naturalist and author of Naturalis Historia, a comprehensive study of natural history advised Roman farmers to harvest fruits for the market during full moon as it would weigh more and for self consumption on a new moon day as it would have better storability. The timber trees were cut on a new moon day. During that period a Royal order was also passed to harvest timber only during the waning phase of the moon. Similarly the traditional medical practices of Ayurveda, Chinese Medicine, Sidha etc. medicinal plants are harvested only at specific time of the day or month. Such practices are known to exist in different cultures across the globe from mountainous habitats to islands and deserts to dense rain forests. Even in Bhutan, Astrology plays a very important role in the life of Bhutanese. They believe that planets and zodiac have their effect on plants and humans. The local newspapers have a section for astrology (‘zakar’) listing days that are auspicious for important activity like constructing a house, marriage, shifting houses, starting business, undertaking long journey etc. Farmers adopting traditional farming follow the lunar rhythms in their farming activities. The rich traditional knowledge passed down to the succeeding generations have contemplated the life patterns of all living organisms woven into the cosmic rhythms. Moon has its influence on the ocean tides, groundwater table and the movement of fluids in plants. Several studies have shown the changes in the photochemistry of plants due to variations in seasons, harvesting period and circadian effect. It is quite interesting to note the research studies on the effect of tides on swelling and shrinking of trees. Renowned physicist and Nobel laureate Gerard Dorda used the concept of Quantum-Hall-Effect (QHE) to compute the effects of gravity from the moon on the water in living organisms. It was found that a regular, reversible, rhythmic pattern of water in cells and the variation in the pattern was maximum during the new moon. Several fishes and insects synchronise their egg laying period during full moon. Many wild animals give birth to their young ones on a full moon day. These cannot be mere coincidences. It’s a fact wherein one can see the effect of cosmic influence but unable to comprehend with a scientific logic. The present scientific world may not accept the fact regarding the influence of the cosmic rhythms and the constellations on the life forms. However, human life, as well as animal and plant life, is strongly dependent on the rhythms of the earth and cosmos. The plant and animal life is instantly influenced by the sidereal and synodic relationships of the sun, earth, moon and other planets. Understanding the effects of cosmos, and timing the farming operations is a zero-cost input for the farmers. It can immensely contribute to the increase of quantity and quality of the produce and reduce the pest attack by tuning farming to the rhythms of nature. This is a clear indication to develop standard operating procedures for crop production and harvesting and benefit from the influence of cosmos at no cost. Farmers and researchers should experiment with the farming calendar and document the veracity of the traditional practices. Had these practices not showing results probably it would have vanished long ago. Traditional knowledge is not about turning the clock back. Rather it’s a set of practices and knowledge systems that have been replicated for millennia, which exactly fits into the definition of scientific experimentation. There is a need to blend the ancient wisdom with modern science. 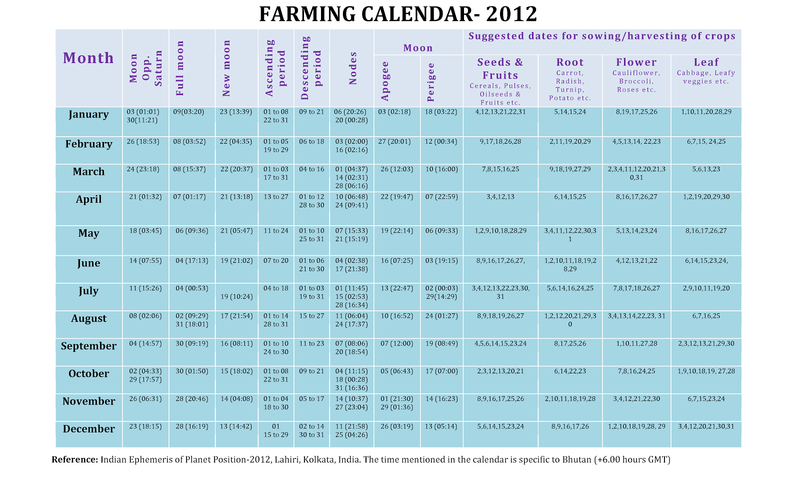 The planting calendar for 2012 is prepared on the basis of such influences which are widely used by the biodynamic farmers across the globe. This calendar is specific to Bhutan which is + 06.00hrs GMT and can be tailor made to suit the different geographical locations. How to use the Lunar farming Calendar? Following are the general guidelines for the use of farming calendar. It occurs approximately once in 29.5 days. 1. Seed sowing, transplanting, grafting, pruning and layering. 2. Spraying BD501 (Cow horn silica) or bio-pesticides to manage pests. 3. Spraying liquid manures and foliar sprays. 3. Spraying bio pesticides to control pest and disease. The moon moving in arc from East to West and this arc gets lower everyday, the Moon is said to be in descending phase. These are the days when moon pass the sun’s path. It creates negative influences on the growth of plants. Avoid all agricultural activities during nodes. Moon orbits around the Earth in an elliptic path. The point where the moon is far away to earth is called Apogee. Moon moves around the earth in an elliptical path. The point where the moon is closest to earth is called as perigee. These days influence the growth of seed and fruit crops and good for sowing and harvesting for the same. These days influence growth and development of root crops and good for sowing and harvesting for the same. These days influence on growth and development of flowers and good for sowing and harvesting for the same. These days help in the growth and development of leafy vegetables and good for sowing and for harvesting. Would you be publishing this useful BD calendar for the year 2013. I will publish the BD calendar for 2013.